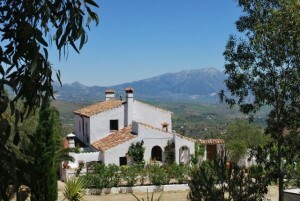 Description The most fantastic Rural Estate in the perfect location just 10 mins from the charming white village of Colmenar and 40 mins from Malaga. The property comprises a main house that has been renovated in exquisite taste, an independent Cottage situated at the lower level of the house and a detatched Guest House. Each of the three houses has its own pool, gardens and leisure areas. The main house consists of a kitchen, breakfast area, laundry and utility room, Dining Room, TV/Sitting Room, main lounge, 4 double bedrooms, 3 bathrooms plus a large self contained studio with bathroom. Outside is an enclosed dining area, 2 courtyards plus outdoor kitchen. pool area with extensive terraces and landscaped gardens with mature trees, flowers and shrubs. The Cottage has large sitting room, kitchen, 3 double bedrooms, 2 bathrooms, outdoor terraces and a lovely pool. The Guest House has sitting room, kitchen area, 2 double bedrooms, bathroom and gardens with yet another swimming pool. There is mains water and electricity and Sceptic tank drainage and broadband internet and satelite TV are available. Throughout the houses there are numerous woodburners. The kitchens are fully equipped and fitted and there are ample fitted cupboards and wardrobes. This is an exceptional property with beautiful views and set in its own land of 29000sq mtrs. The property is currently used as an exclusive rental property and it yields a substantial annual income. The Good Will, ongoing client bookings, client listings, website etc are included in the sale should any buyer wish to continue with tourist income from the property. It is far too extensive a property to list all features and must be seen to be fully appreciated. At the listed price it is an absolute bargain.